Like a boxed wine without the ugly cardboard, a wine bag is the perfect way to keep the picnic fun flowing. Thus Vinnaturo can offer eight different wines in 1.5l bags — equal to two bottles — at £20 a pop (or squeeze), from organic Cabernet Franc to biodynamic Sangiovese Rosé. In addition, a tap fixed to the outside of the bag enables you to pour with minimal oxygen entering and contaminating the wine left inside, so it lasts longer. Craven explains that ‘you can put any kind of wine in a box, bag or keg. I supply young, fresh wines, but also some more complex, older wines’. 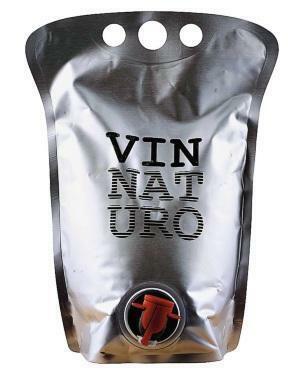 And bagged wine is not just ethical and convenient for park picnics — Vinnaturo’s juice tastes pretty good too, which is why it’s served at wine-centric restaurants from Ducksoup to Primeur, and is the only wine Chick ’n’ Sours has on the menu. Arguably the real bagged wine king, though, is Andrew Nielsen of Le Grappin. Like any good bag designer, he has given his haute 1.5l pouch a name: the ‘bagnum’. Like Craven, he detested the waste and carbon emissions from importing wine. Now he sources small wine producers (particularly favouring Burgundy) and fills his bagnums ready to be brought to the UK with minimal carbon emissions. And again, this is without any detriment to the taste — Le Grappin has been saluted by no less a wine maven than Jancis Robinson. Slurp his stuff everywhere from Noble Rot to Llewelyn’s in Herne Hill, where Nielsen can also be found at the Sunday market. Perfect for Brockwell Park boozing. Until wine bags filter down to the high street, there are other brilliant independent importers keeping their wines sustainably boxed. Take When in Rome. Because making and recycling glass uses so much energy (more than 4kWh per bottle — enough to power your TV for a month), it has switched to bag-in-box. But while the bag inside a 2.25l BIB of When in Rome’s rich Barbera (£27) can be recycled in Italy, it’s not yet possible in the UK. According to its website, that’s because: ‘We don’t drink enough box wine.’ A call to arms if ever there was one.